Off-Grid Solar System Several years ago I decided to "go green", well at least a bit. I've built an off-grid solar system suitable for powering most of the devices in my living room like TV, computer, printer, lighting, musical instruments and other equipment. Having installed two 130 W solar panels on the balcony the system provides me with about 150 kWh of green energy every year. The following chapters summarize the build and may hopefully encourage you to assemble your own system. A stand-alone solar system works completely independent from the electrical grid, thus the name "off-grid". The major difference to grid-tied systems is the need for a battery, since unused energy would be wasted otherwise. 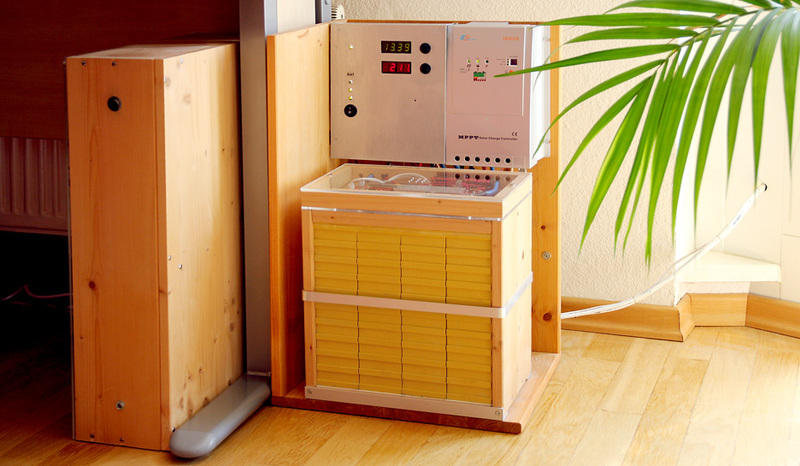 Battery powered off-grid systems can be ecologically worthwhile, but not economically worthwhile, because good energy storage solutions are still quite expensive. So even after many years of use the overall price per kWh is effectively higher than the price charged by the local energy provider. 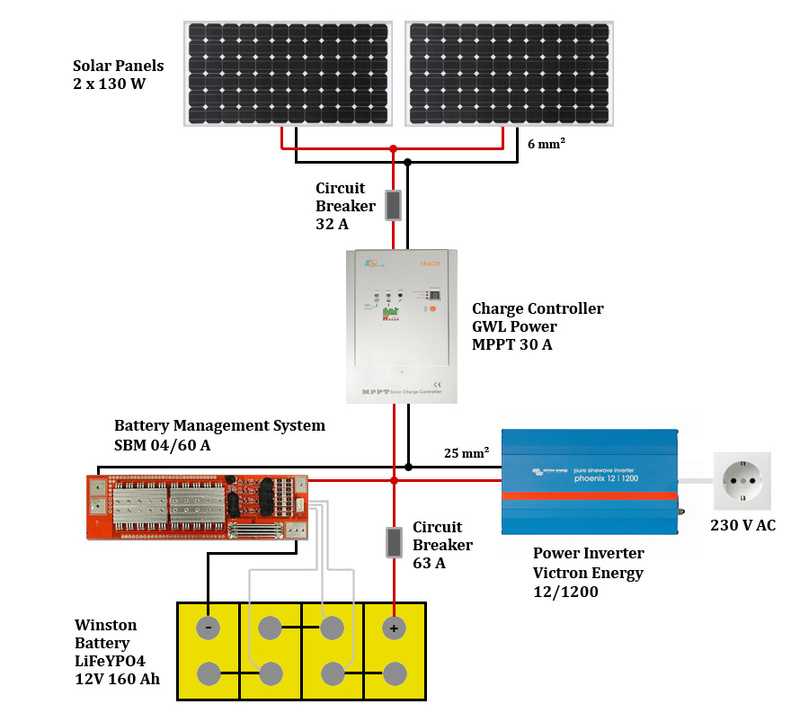 An off-grid solar system consists of at least three basic components. The solar panels, the charge controller and some kind of battery, whereas the latter is also the most critical part. If you need to power conventional household devices you also have to add a power inverter, which converts DC voltages into nominal AC mains voltage. Warning: Even though LiFePO4 cells are much more safe than conventional lithium ion batteries, make sure you never short-circuit them in any situation. Read the batteries manual in its entirety before use. How do I choose the right components ? How much energy do I need ? So, as a first step I estimated that the devices in my living room (the loads) would not consume more than 1.5 kWh per day. Which gave me a rough number for sizing the battery. After reading a lot on different battery technologies and their pros & cons I eventually went for Winston lithium iron phosphate cells (LiFePo4). One of the main reasons being their superior life span. With carefull treatment these cells can last many thousand charge/discharge cycles and up to 20+ years. In order to reach such a long life span there are of course limitations involved. One of them being not to discharge the cells below 30% or 3.2 Volts respectively. 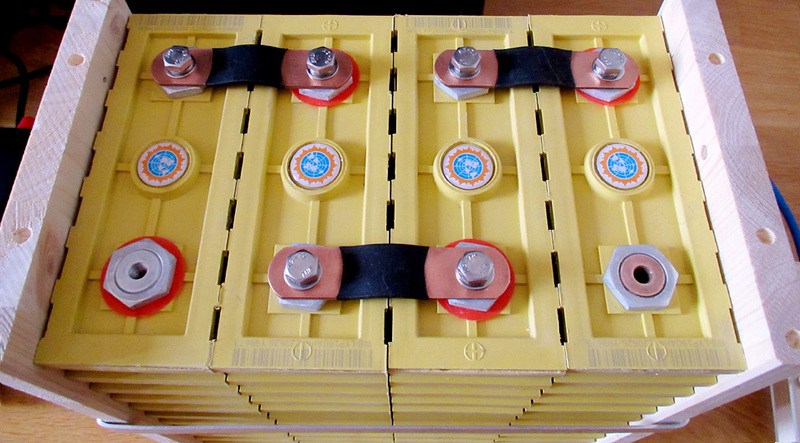 Thus, for storing 1.5 kWh of usable energy a battery capacity of at least 2.0 kWh is needed. Currents below 100 A are considered manageable and don't require extensively thick cables. So I knew a 12 Volt system would be sufficient. In terms of LifePO4 batteries a 12 Volt system consists of 4 cells, yielding a usable voltage range of about 12.8 to 13.8 Volts. As we now have determined the properties of the battery pack what about the actual solar panels ? Under these optimal circumstances a 100 Wp monocrystalline panel may be able to produce up to 6x 100 Wh = 600 Wh per day. So how many panels are needed for collecting 1.5 kWh ? As you can imagine such optimal solar conditions as described above are quite rare. So in practice, either the panel count would need to be increased or a lower solar yield had to be acceppted. I went with the later because it turned out that on average the two 130 Wp panels are sufficient for my needs and during summer the system often generates more energy than I can make use of. Within 5 years the here presented two panel off-grid system provided me with around 700 kWh of eletrical energy. The theoretical maximum solar yield within this time frame would have been around 800 kWh/kWp * 0.26 kWp * 5 yrs = 1040 kWh. But it's in the nature of running an off-grid system that you normally don't make use of all the energy it generates over time.